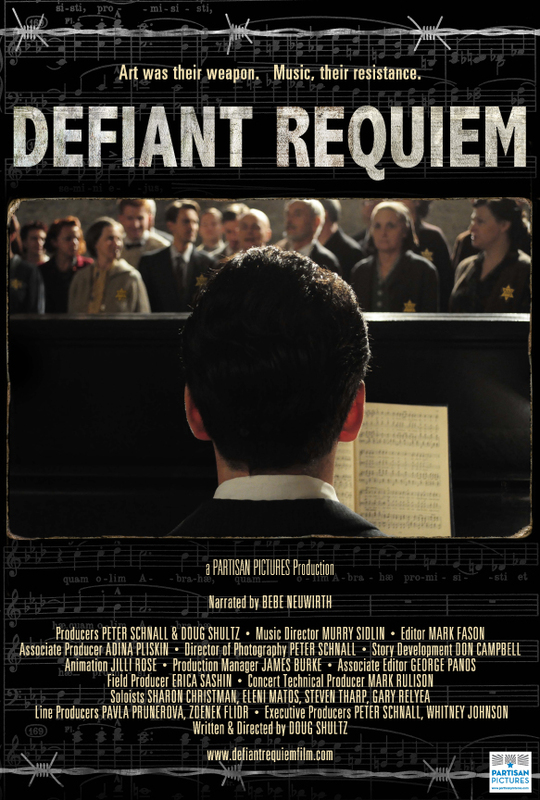 Defiant Requiem is a feature-length documentary film that tells the extraordinary, untold story of the brave acts of resistance by Jewish prisoners at Theresienstadt (Terezín) during World War II. The film highlights the remarkable story of Rafael Schächter, a brilliant young Czech conductor who demonstrated moral leadership under brutal circumstances by sustaining hope and courage for his fellow prisoners by creating a prisoner choir and “singing to the Nazis what they dared not say.” This is a film about how a rare form of courage sparked compelling determination to survive by answering the worst of mankind with the best of mankind. Defiant Requiem was nominated for two Documentary Emmy Awards in 2014 for best writing and best feature length documentary. The film is the recipient of numerous awards and has been broadcast on PBS, BBC4, French TV and Globostat in Brazil. Offered in connection with Pictures of Resistance: The Wartime Photographs of Jewish Partisan Faye Schulman, an exhibit on display at the Jewish Museum Milwaukee, March 29 – May 26, 2019.